A sherd of poorly fired ceramic of uncertain prehistoric date. 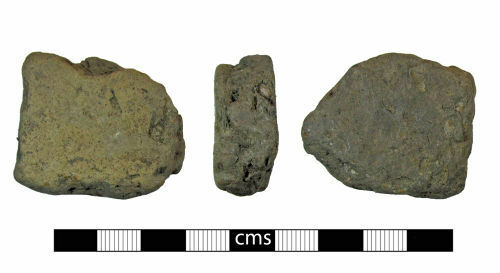 The sherd has a buff outer side while the rest is a mid brownish grey colour with occasional rounded stone inlcusions. The sherd is likely to be from a vessel however it may also be fired clay, or just a poorly fired vessel. It is suggested that this sherd is Bronze Age or early Iron Age in date. Several pieces of prehistoric pottery spanning the late Bronze Age to late Iron Age, of which these are some, were recovered from a small area around Brightwell Barrow in the 1920s.